Let’s face it, most Project Managers live for holidays like Thanksgiving so they can show their skills to their family and friends and truly WIN the holiday. If you are wondering how they do it, and possibly how you can too, we have broken it down for you. For Project Managers, the ability to clearly define scope and stick to it through the duration of the project is one of the most important aspects of a project. A clearly defined scope allows a Project Manager to establish a timeline, assign tasks, and allocate resources when needed. With Thanksgiving, Project Managers clearly establish the objective (Dinner at 4pm) and then assess the steps and resources needed to achieve the expected result. 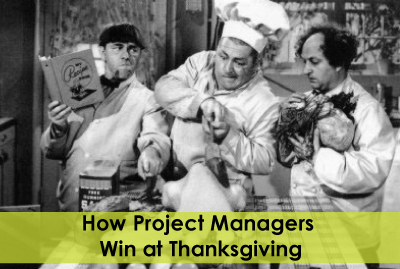 Because of their ability to easily define scope and plan accordingly, Project Managers glide through Thanksgiving preparation with minimal stress. In order to see the scope play out as planned, all the moving parts need to be established and owned by relevant resources. A schedule needs to be created so no pieces go unplaced and at the end, the puzzle is complete. A Project Manager will take Thanksgiving Day and break it into sequences, clearly defining what activities will take place at what blocks of time. If a Project Manager’s family is helping with food, he will note that as resource allocation because it will fall into the schedule. Thorough time management and estimating will not only keeps a Project Manager from serving cold turkey, it also keeps the flow of the event moving smoothly. Project Managers are experts at managing budget, risk, and change. As a project begins, things come up, problems arise and changes are imminent. It is a Project Manager’s job to forecast some of these potential roadblocks and have a plan for when they occur. Having these skills makes defining potential Thanksgiving catastrophes a breeze. Are the cousins picky eaters? A Project Manager has PBJs on standby. Potential feuding relatives? A Project Manager has arranged the seating accordingly. And for most other problems, a Project Manager has an extra stash of wine on reserve. While we think most Project Managers might tackle Thanksgiving like they would a client project, some might benefit from this refresher on how to adapt their skills to other life projects. For those that aren’t Project Managers by trade, we hope these serve as tips to get through your Thanksgiving with ease. There’s still plenty of time to put these lessons in action before the big day.